BRITISH Intelligence reported a contemplated raid on London by a large force of bombers. A certain squadron near Dunkirk was asked to intercept these ships and to destroy as many as possible. Consequently the air was filled with British craft patroling the coast. As the weather became unsafe for flying, most of the patrols returned to their bases, but several, which had become separated, did not return for some time. Let us follow one of these, an S.E.-5 flown by Lt. Allen Archer. 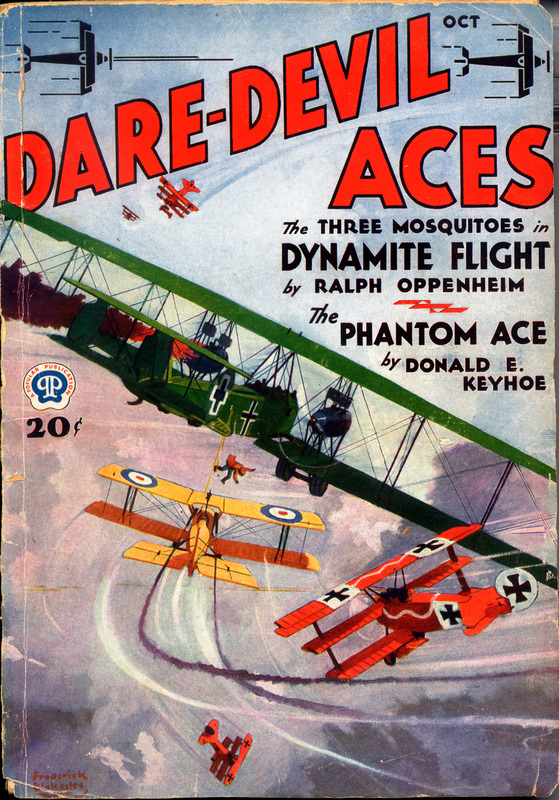 Archer was returning to his drome when suddenly a huge bomber hove into sight, escorted by three Fokker triplanes flying high above and ahead. Archer was sure that this was the vanguard of the raid and looked anxiously about for help. Not an Allied plane was in sight however, so it was up to him to do something by himself. To attack this huge monster with his comparatively tiny S.E.-5 seemed futile. However, he realized the number of women and children who might not see tomorrow should this ship arrive over London; so despite the heavy odds he decided to attack. 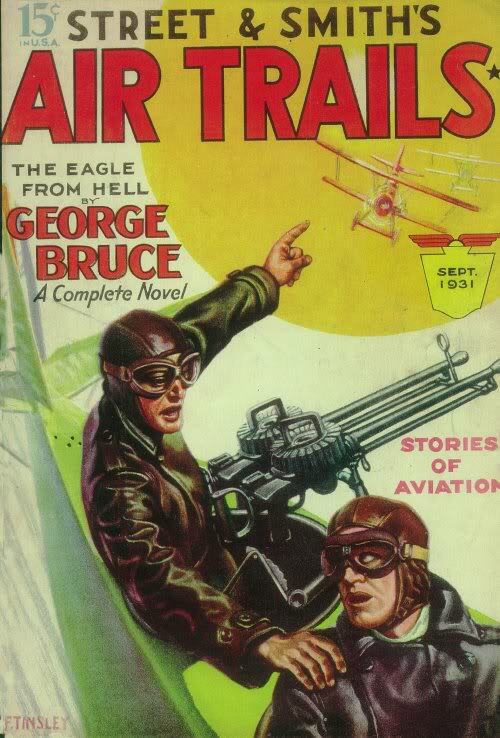 He had no sooner made his decision than he found himself in a savage combat with two of the Fokkers. He shot one of them down and, with the other on his tail, headed for the lumbering giant. As he drew near he let go a burst, but as far as he could see it did no damage. Yet to his utter surprise the bomber gave a lurch, a man fell or jumped overboard and the engines on the left burst into flames. The bomber tipped up and dove into the clouds. Archer was so occupied with the two remaining Fokkers that he was unable to follow the bomber down. After a short combat he drove them off and returned to his field. The bomber landed in Germany, so what happened was never known by the Allies. 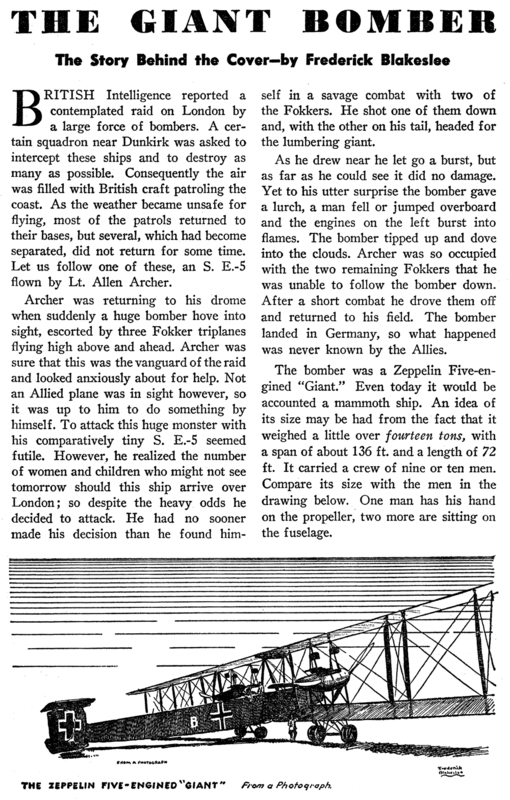 The bomber was a Zeppelin Five-engined “Giant.” Even today it would be accounted a mammoth ship. An idea of its size may be had from the fact that it weighed a little over fourteen tons, with a span of about 136 ft. and a length of 72 ft. It carried a crew of nine or ten men. Compare its size with the men in the drawing below. One man has his hand on the propeller, two more are sitting on the fuselage. ZEEBRUGGE developed into an important naval base early in the War. The submarine had its home there; warships, torpedo boats and transports were here also. From 1915 until it was liberated by the Allies in October, 1918, Zeebrugge was the target for raid after raid by Allied aircraft. Here was fought the famous naval battle—the blocking of the Mole on April 23rd, 1918—which was made possible by aircraft. The raids were too numerous to mention in detail. 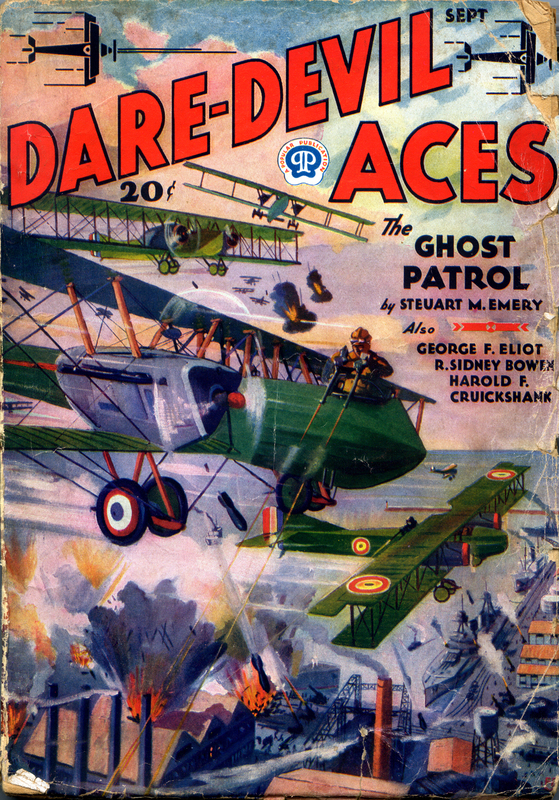 The one shown on the cover occured on March 20, 1916. Early that day a combined force of approximately fifty British, French and Belgian airplanes and seaplanes, accompanied by fifteen fighting ships, left various bases and attacked the military establishment, docks, submarines, ships, etc. This was the largest air-raid as far as the numbers of machines engaged were concerned, that had been reported up to that time. All the planes returned safely after dropping approximately ten thousand pounds of high explosives. 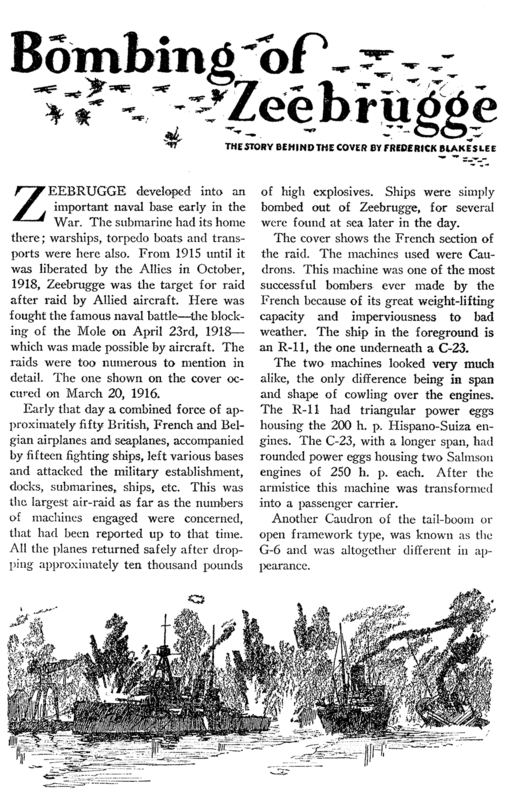 Ships were simply bombed out of Zeebrugge, for several were found at sea later in the day. The cover shows the French section of the raid. The machines used were Caudrons. This machine was one of the most successful bombers ever made by the French because of its great weight-lifting capacity and imperviousness to bad weather. The ship in the foreground is an R-ll, the one underneath a C-23. The two machines looked very much alike, the only difference being in span and shape of cowling over the engines. The R-ll had triangular power eggs housing the 200 h.p. Hispano-Suiza engines. The C-23, with a longer span, had rounded power eggs housing two Salmson engines of 250 h.p. each. After the armistice this machine was transformed into a passenger carrier. Another Caudron of the tail-boom or open framework type, was known as the G-6 and was altogether different in appearance.